We talked about doing a large project to replace the DC3 From Hell. There was an airplane tip tank in the scrap pile and we decided to use it as a form. The only rocket that we could think of that was the same shape, was a V2. And so started the PROJECT. 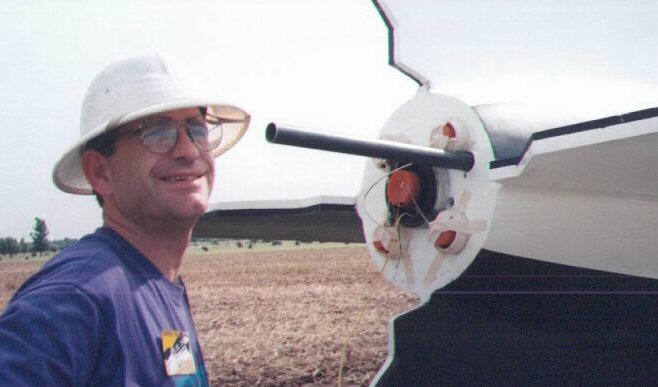 We started building in January of 1997 and laid up first one side of the rocket and then the other using 2 layers of fiberglass and resin and then gluing on one inch wide foam strips. Two more layers of fiberglass went on over the foam. After this, it was decided to lengthen each side by two feet to make the V2 almost 1/3 scale and a bit more stable. This operation took a few weeks and we almost did not complete the rocket. For the centering rings and fins, we found surplus one inch thick aircraft fiberglass phenolic honeycomb. This material is very light and very strong and is used for aircraft floors and doors. For the recovery section, we used a surplus 28 foot chute for the main. The nosecone was connected to a four foot Stroud chute with 400 pound test rope. The Stroud pilot chute was connected to the apex of the main 28 foot chute. 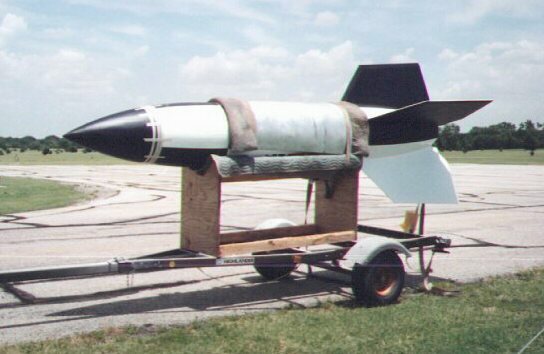 The main M motor ejection charge was used to separate the nosecone which would pull out the Stroud chute which would then pull out the main chute. For propulsion, we used all AeroTech motors: an M1939 with a ten second delay for the main thrust, thermalite airstarting two K1100 motors to help boost it off the pad, and two K550 motors to gain more altitude. An altitude of 3,500 feet was projected using these motors. The rocket ended up 14 feet long and 22 inches in diameter. It weighed 115 pounds including the 15 pound main parachute. The motors weighed in at 32 pounds, so the total liftoff weight was 147 pounds. We built a launch pad out of two inch square steel tubing which weighed about 50 pounds and a 1/4 inch thick blast plate. We used a twenty foot launch rod that was one inch in diameter. 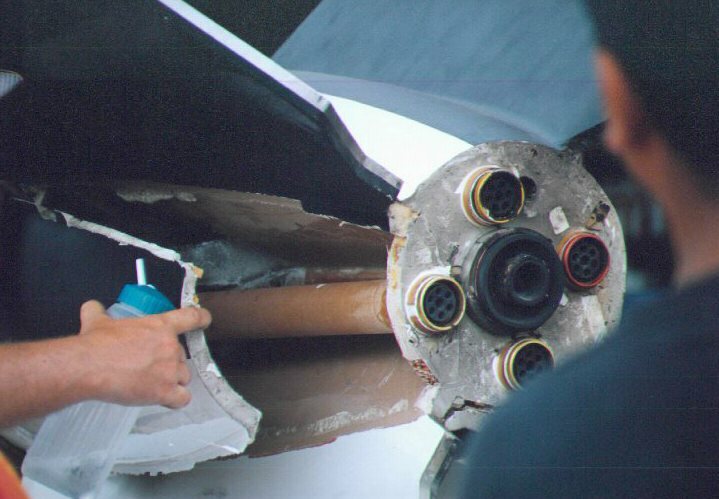 The rocket had an internal launch lug. To aid in building and transporting this beast, we contructed a cradle and eventually mounted this cradle on a converted boat trailer for transport to and from our Medford launch site, and to and from the launch pad and recovery site. We prepped the motors on the Friday night before Sooner Boomer 14 in hopes of launching on Saturday. The wind Saturday did not cooperate and we had to put the rocket back in the hanger with hopes that the winds on Sunday would die down. Sunday started out with 5 mph winds that grew to 8 to 10 mph by 9:00am. We still had hopes of launching and did all the setup tasks and prayed. Around lunch, a passing thunderstorm reversed the winds and we launched while the wind was at 2 to 3 MPH. The roar from the M motor and the two K1100 motors was awesome with one of the K550 igniting at the end of M motor burnout. The last K550 did not light. At the end of the ten second motor ejection delay, the special ejection charge ignited and blew off the nosecone. The nosecone then pulled out the Stroud chute and then the nosecone tether broke and the cone tumbled down from an estimated 3,000 feet. The Stroud chute then pulled out the main before it also stripped, but it had done its job. The huge 28 foot chute gently lowered the V2 over a five minute period to land 100 feet from the road in a plowed field and then it slowly collapsed in the, at that time, zero wind conditions. 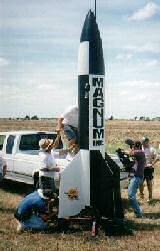 We had followed the rocket with the truck and trailor, fully expecting to have to douse the chute with manpower, and finding that all we had to do was to fold up the chute and put the rocket back in its cradle for transport back to the hanger. It was noted that the ejection charge was too large and had shattered the motor tube and almost blown off part of the boat tail. We have some damage to fix to make the V2 flyable again.